HCMC now has 10 severely downgraded apartment blocks with hundreds of households residing in. City leaders have required authorized agencies and local authorities to remove these households to safety and rebuild the buildings, still little progress has been seen and residents continue living in danger. Among the run-down ones is the two storey metal roofing building at 137 Ly Thuong Kiet street in Tan Binh district, built before 1975. 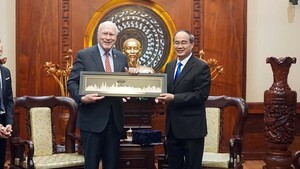 The building at 43 Binh Tay street in the district is also in the same destiny. The family of Ms. To Le Hue have lived there for 40 years. Not long ago, a concrete debris fell down in the corridor in front of her apartment, slightly hurting a family member. Mr. Vuong Thach Phat said that living in the old apartment block just like living with the death but they have no choice. Local dwellers would remove out of the building if authorized agencies publicize removal time, temporary residence and resettlement assistance policies. Another apartment building in the list of severely downgraded ones locates at 47 Long Hung street in Tan Binh district, comprising 30 apartments measuring 20 square meters each built in the 1960s. 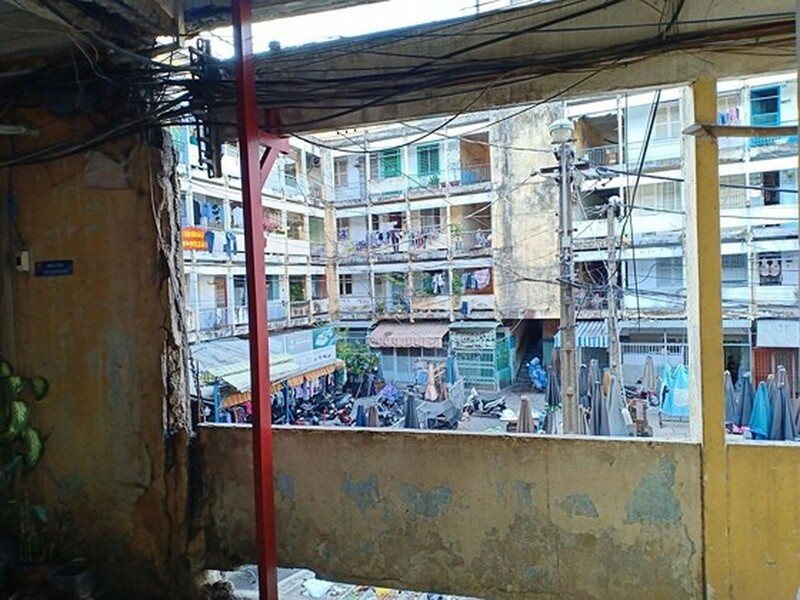 Nearby, the building at 40/1 Tan Phuoc street is about 1,000 square meter wide with 78 apartments, lot of cracks on the walls and no exit way. Corridors are packed with motorbikes. Worse the building is surrounded by stalls selling flammable commodities. The sole way out from the building to Tan Phuoc street is only two meter wide. Similarly, residents are living in slump condition in the apartment block at 47 Long Hung street, Tan Binh. The apartment block at 155-157 Bui Vien street in District 1 is subject to Level D in dire need of resident evacuation but dwellers are still living there. Vinh Hoi apartment building in District 4 built before 1975 with 244 apartments is also in the same situation. 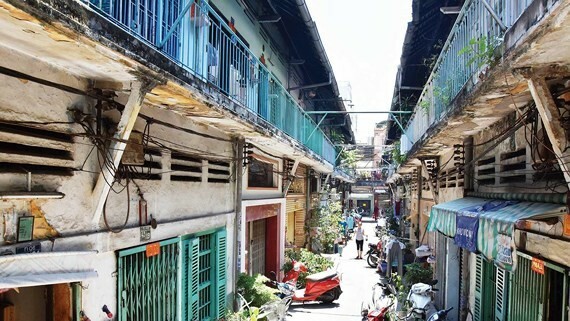 With the target of solving 50 percent of 474 old apartment blocks by 2020, HCMC People’s Committee has authorized districts to repair, upgrade the old ones and rebuild those built before 1975. However, it is unlikely obtainable because the city has just dismantled 32 old apartment blocks for the last decade with very slow progress of new rebuilding. One of difficulties is that most residents have refused to remove from dilapidated apartment buildings fearing that they would not be resettled in the same area. 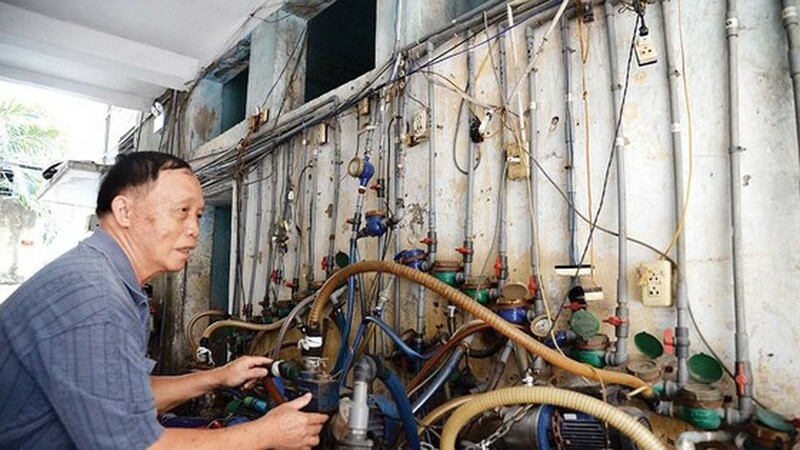 Sixty six years old Pham Van Mung residing in 149-151 Ly Thuong Kiet apartment building said that since 2009, the district has planned building a new building without any progress. If the district had publicized specific plan covering resettlement policy and new apartment prices, many families would have removed. Residents in Vinh Hoi apartment building are waiting for local authorities’ decision about removal measure. “If the district arrange temporary residence place too far from the old place or the price of resettlement apartments is too high, we will not remove because most of us are peddlers unaffordable for the new flats,” said Ms. Pham Thi Thanh Tam. Mr. Bui Thanh Tan, deputy chairman of District 4 People’s Committee, said that investors have not been selected to rebuild Vinh Hoi apartment block. In the meantime, Tan Binh District’s representative said that the district is drawing removal and temporary residence policies for five apartment blocks namely 47 Long Hung, 137 Ly Thuong Kiet, 149-151 Ly Thuong Kiet, 40/1 Tan Phuoc and 170-171 Tan Chau. The remaining of households in these five apartment blocks are expected to evacuate before April 30, 2019. Most of the downgraded apartment blocks are small with the area of about 500 square meters while the number of dwellers is high so they are unattractive to investors. For instance, the apartment block at 137 Ly Thuong Kiet has the total area of nearly 291 squares meters while there are 34 households living there. The building at 170-171 Tan Chau measures 298 square meters in width and accommodates 24 families. Some others measuring few hundreds square meters are home to over 100 households each. 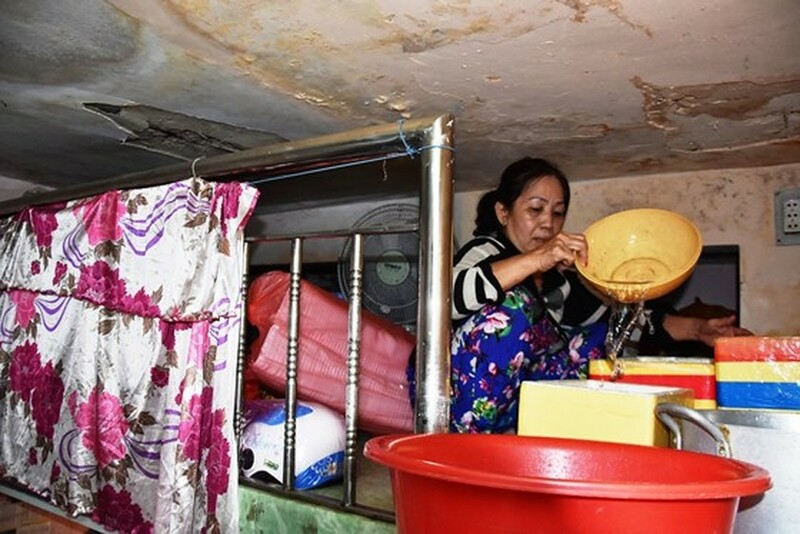 Mr. Mai Dang Thuan, head of Tan Binh district’s Urban Management Department, said that in principle, after clearing old apartment blocks, local authorities must resettle dwellers in the same area for those in need. However the land plot area of the old buildings is too small so if residents are resettled there, there will not be room for investors to invest in other services to reclaim investment funds. Increasing the area will break plan so it has been very difficult to implement the policy of rebuilding old apartment blocks. Projects with already drawn investment policies have also met difficulties in investor selection, removal and temporary residence measures and the way to dismantle old apartment buildings. Currently the district is waiting for the city People’s Committee’s opinions about temporary residence, household removal time as well as capital recovery plan for investors to build new works. Another difficulty comes from compensation and resettlement disagreement between project investors and dwellers. Lots of people require compensation higher than the level accepted by the investors. Meanwhile, most apartment buildings built before 1975 locate in the center area of the city, where land use coefficient and population density are tightly controlled. Investors must take time to adjust projects’ scale and that might affect their profit. That is the current situation in District 3. Mr. Do Minh Long, head of Urban Management Division in the district, said that they started calling for investment in Nguyen Thien Thuat apartment block ten years back with many flexible measures without result having been gained so far. The district People’s Committee so has proposed the city People’s Committee to permit combination of old apartment block rebuilding projects and other residential area projects. Specifically, after small apartment buildings are dismantled, investors will build commerce and service works there and residents will be relocated in other residential projects such as the one in Le Van Sy street or the new apartment block in Nguyen Thien Thuat street. Obviously, district authorities must be enable to connect together to create a land fund large enough to lure investors and speed up upgrading and rebuilding of old apartment blocks. To obtain that purpose, benefits must be harmonized among relevant sides for residents to have new accommodations, businesses to be profitable and the Government to have new works.